Improves body’s vitality and energy. Supports the pineal and pituitary glands, parathyroid, thymus and adrenal glands. Excellent for providing energy for those suffering from chronic or adrenal fatigue. ENERGIZE™ BENEFITS: Improves body’s vitality and energy. Supports the pineal and pituitary glands, parathyroid, thymus and adrenal glands. Excellent for providing energy for those suffering from chronic or adrenal fatigue. ENERGIZE™ INDICATIONS: Energize™ is formulated to reduce fatigue and help you feel energetic throughout the day. Great for empowering, invigorating and overall stimulation when you are mentally, physically, or spiritually exhausted. Energize™ supports the adrenal glands as a stimulant to increase energy. It can be soothing for anxiety and stress related complaints and is recognized for its benefits of strengthening the vital center. HOW TO USE ENERGIZE™: Designed for aromatic and topical use. If using topically, we recommend 1- 2 drops on temples, heart, liver (right front), pancreas (left front), and glands. Always test on a nickel sized portion of skin first. Make sure your skin can handle the oil/blend before using. Dilute to start or if any redness occurs. For Aromatic Usage, hold the bottle under nose for 3 or 4 breaths. WHEN TO USE ENERGIZE™: To aid with energy, apply 2- 3 times daily or as needed during particularly fatiguing moments. Put a few drops on a tissue and have it close, where you can smell it, when you start to feel out of control. 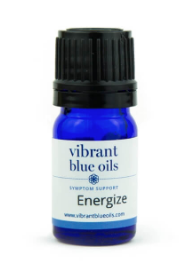 ENERGIZE™ INGREDIENTS: Vibrant Blue Oils Symptom Support Energize™ blend contains a proprietary formulation of organic and/or wild crafted essential oils of Spearmint, Birch, Peppermint, Myrtle, Lime, Black Pepper, Sage, Nutmeg, Geranium, Myrrh, Chamomile. Birch (Betula lenta): Helps treat poor circulation and hypertension. Possesses anti-inflammatory and cortisone-like functions that help treat muscle and joint discomfort, arthritis, gout, tendonitis, rheumatism, and broken or bruised bones. It helps clear the accumulation of toxins and edema, and it can help treat cellulitis and obesity. Peppermint (Mentha piperita): Improves mental clarity and raises energy levels. Has anti-inflammatory and anti-spasmodic properties, which help support the relief of pain and inflammation and calm the spasms that cause muscle cramps. Myrtle (Myrtus communis): Helps to balance the thyroid. Whether you have hyperthyroidism or hypothyroidism, Myrtle can help you bring your thyroid activity into the normal range. Lime (Citrus aurantifolia): Lime oil is uplifting and stimulating to the brain. It helps refresh a tired mind, relieve apathy, anxiety, and nervousness, clear thought and aid concentration. Black Pepper (Piper nigrum): Stimulatory and warming, it helps stimulate circulation, increase energy, and treat muscle spasms, and other aches and pains. Sage (Salvia fruticosa miller): In Europe it has been recognized for its benefits in strengthening the vital center. It works well as a general stimulant. It activates the nervous system and adrenal cortex. Nutmeg (Myristica fragrans): Supports adrenal function and helps increase energy to help overcome nervous fatigue and relieve chronic fatigue syndrome. Geranium (Pelargonium Graveolens): Stimulates the immune and lymphatic systems and helps regenerate healthy cells. Myrrh (Commiphora myrrha): Relieves apathy, lack of incentive or energy. Because of its warming and stimulating nature, it is good for all stress-related conditions and anxiety. It also boosts immunity (stimulating the production of white blood cells).